Lakewood, CO began in 1889 with the help of Charles Welch and W.A.H. Loveland. The city was originally named Jefferson City and later incorporated in 1969. It wasn’t until a short-while and full election later that it was renamed. Lakewood is now a Home Rule Municipality located inside Jefferson County. It has a population of about 142,980, which makes it one of the largest cities in Colorado. Lakewood is located a couple miles east from the well-known Red Rocks Amphitheatre and just eight miles from downtown Denver. Lakewood has more than 7,100 acres of open space which incorporates 99 parks and over 180 miles of trails. The city’s park and recreation life let locals enjoy numerous outdoor activities like hiking, biking and horseback riding. Also located in Lakewood are the Fox Hollow and Homestead golf courses offering golfers a variety of playing terrain and a spectacular escape with stunning views. 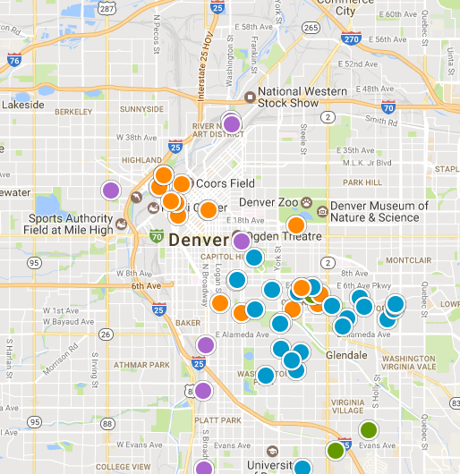 And with just a short drive, locals can head over to the heart of downtown Denver to experience wonderful dining, shopping, and entertainment. Lakewood is home to Lakewood High School, Green Mountain High School, Bear Creek High School, Brady Exploration High School, Alameda International High School and International Baccalaureate schools. Colorado Christian University is also located in Lakewood. Lakewood has a median home value of around $360,700 for a single-family home with home values rising over 9% increase from the previous year. Want to see the latest Lakewood housing market activity? Create a free custom market report for YOUR neighborhood or area!